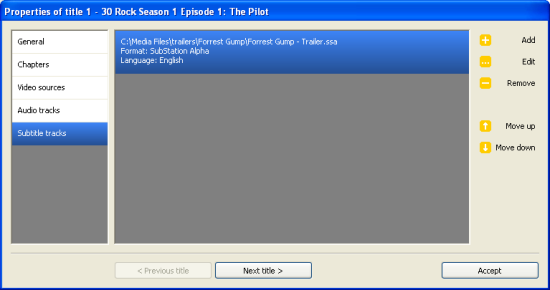 First, use the "Browse" button to select where you want the temporary and/or image/DVD folder files to be generated. 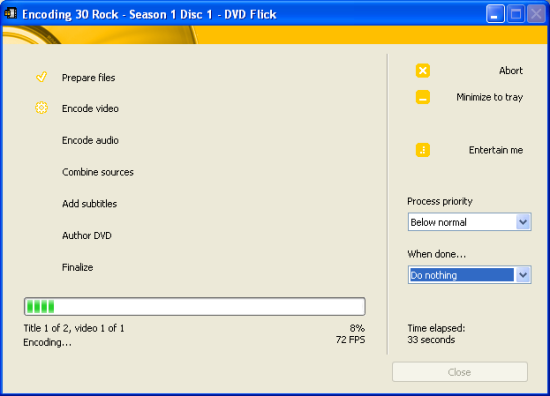 It is essential that you use a newly created folder, not something like "My Documents", because DVD Flick will delete all files in the folder before it creates any (and you get a warning message about it too, but it is often easily overlooked). Now we can use the "Add title" button to load in our video files. The following diagram from the official DVD Flick guide demonstrates the organisation of a project. Each "Title" can have multiple video files. Or you can create a title for each video file. An real world example might be say if you have TV downloads for Lost and Heroes, 3 episodes for each show, you might create a Title for Lost and another Title for Heroes, and add the 3 episodes to each of these titles as video sources. It's important that all the video sources in each title should have the same specifications (aspect ratio, framerate). Once you have added a title, you can double click on it or use the "Edit Title" button to edit its properties. In the "General" section, the "Target aspect ratio" (which is automatically detected from your input video) specifies the aspect ratio of the input file. 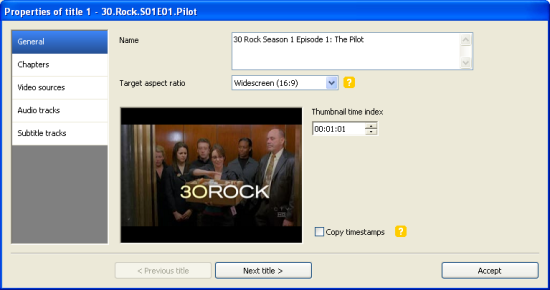 You can also select a thumbnail index, the picture used in the menu to present the title. 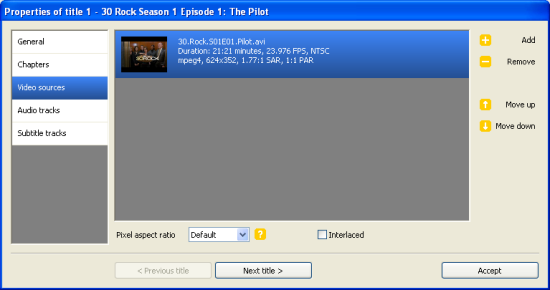 Note the "Previous title" and "Next title" buttons down below, this can be used quickly to skip between the titles and configure their settings without closing the settings dialog window. 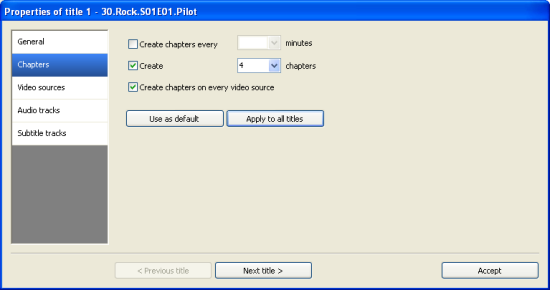 The "Chapters" section allows you to create chapters at set intervals, or choose to create a set number of chapters. You can also make sure each video source in your title has a chapter automatically added at the beginning. You can apply the settings here to all titles if you wish using the "Apply to all titles" button, to quickly add uniform chapter settings for all titles. The "Video Sources" allows you to load in more videos files to this title. Each video source will play automatically after the last source has ended. Think of multiple video sources as joining multiple files into one big video file. Just make sure these sources have at least the same aspect ratio and framerate (preferably same resolution and audio specs too). 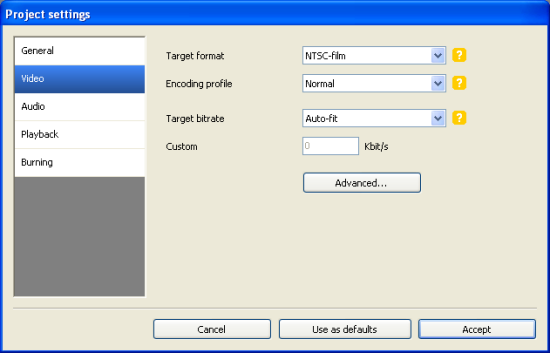 Note that the details about the video is displayed here (framerate, resolution), and you can use this information to set the system (PAL, NTSC, NTSC-Film) information without using GSpot as recommended by this guide. You can also select different pixel aspect ratios for each video source (for example, if some sources are anamorphically encoded, while others are not) and also whether the source is interlaced or not. 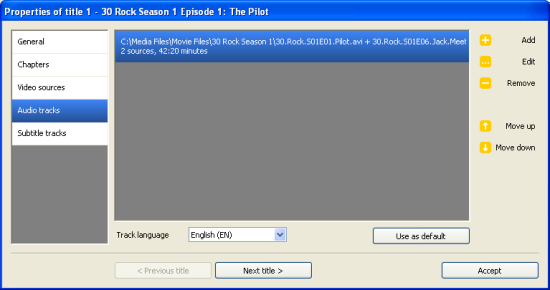 You have 3 episodes of Lost which you've loaded in as video sources. 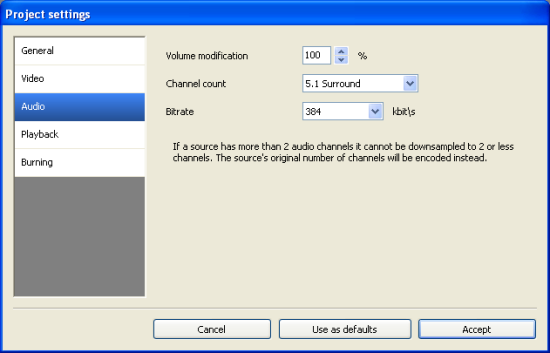 This will automatically create 1 audio track (composed of 3 audio sources). Let's say you want to add foreign language track, then you need to create another track composed of another 3 audio sources (and change the language setting accordingly). Just make sure the length matches for all these audio and video sources, as otherwise, you will run into problems with audio synch. For "Subtitle Tracks", you can load in subtitle tracks for your video (similar to the way audio tracks work, each track for a language, for example). Most of the common format are supported, like SSA, SRT, SMI. Once you add a subtitle track, you can double click on it to change its settings and preview it. All the options are pretty straight forward. 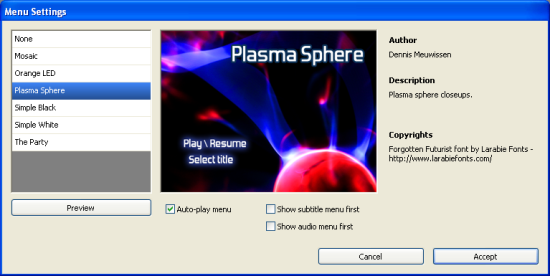 Repeat all of the above for each title, and when you are finished, click on the "Create DVD" button to start the encoding, authoring (and optionally, burning) process. Got more questions? Post them in our DVD Flick Forum and get them answered by other expert users.